Scotland is one of those incredible places where you turn corner after corner and each is more breathtaking than the last! (Exactly the same as Norway!) The problem with places like that is there is SO MUCH to see. How do you possibly narrow it down to fit into a reasonable road trip? Should you focus on cities, history, HARRY POTTER, hiking, views, or lochs? Or a bit of everything?? This unmissable Scotland Itinerary will allow you to create the perfect Scottish Road Trip and make the most of your time in this breath-taking country. Some things you need to know about Scotland before you go. Scotland Itinerary DAY 3- Harry Potter Time! Whether you're in a motorhome, car, motorbike or any other vehicle, (some crazy people cycle it!!) this Scotland Itinerary can be adapted to suit all tastes, abilities and durations. Personally, we avoid cities as much as possible- we prefer being out in nature. But the cities in Scotland are well worth a visit if you have time. There is another language in Scotland called Gaelic (pronounced GA-LICK) which is technically the National language, but only 1% of the population speak it. You might see some signs in Gaelic around the country, but there will always be an English version too! They drive on the left in Scotland, just like the rest of the UK. There is no proper border between Scotland and England, so you can explore Scotland from England without taking a passport. Ok, enough pre-amble. Onto our Scotland Itinerary and route planner. This route can be followed in either direction, and adjusted as your time allows. It can also be altered for the weather- it rains FREQUENTLY in Scotland. But often if it's raining on one coast it can be lovely on the other- so keep an eye on the forecast and plan accordingly. For us, it rained solidly for 3 days on the west coast- the Isle of Skye was a complete washout, even in July, but up at John o'Groats it was beautiful weather- so we detoured and went up there instead! Our Scotland Itinerary is around 800 miles (1300km), with around 23 hours of actual driving over a 10 day period. We probably drove further than that as we explored with our motorhome- we like to detour as we drive to see fun sounding places! TOP TIP- If you're not from the UK and you don't really understand football, don't mention football. The rivalry between Celtic and Rangers fans (both clubs are based in Glasgow) is HUGE- and supporting the wrong one could end in tears- for you. Embrace your tourist side and stay impartial. The same is true in Liverpool and Manchester too if you venture further south. Loch Lomond is actually part of the Trossachs National Park, which has 22 lochs! Loch Lomond is the biggest. You can kayak, paddleboard, canoe and even hire jetskis in the summer. There are 30 islands on Loch Lomond alone to explore- plenty to keep you occupied if you want to stay for a few days. Wild Camping is forbidden within the Trossachs National Park, so be careful where you stop for the night. We chose to drive out of the National Park and camped in a layby on the way up to Loch Ness. If you have time, detour to Oban. I LOVE this town- it's got the prettiest harbour and if you go in Summer you can do a ferry tour out through some of the islands- well worth the trip on a calm day. We stayed here a few years ago and the people were very friendly- would love to go back one day with the Motorhome. I remember standing outside our cabin and gazing up at the stars in absolute amazement- they were so bright and clear. Magical. Another Detour worth the effort is to Devil's Pulpit- a hidden waterfall between the rocks. Full directions can be found here. Fort William is known as ‘the gateway to Ben Nevis' , which is the UK's highest peak. It's also close to Steall Falls- the second highest waterfall in Scotland at 120m and the waterfall in Harry Potter and the Goblet of Fire, in case you're wondering!! Getting there is about a 2.5 miles walk and takes about 1.5-2 hours depending on how often you stop. It's good for kids, as you can see here. This is the viaduct made famous in the Harry Potter films. You can walk right up to the base of it. You can also ride on the Jacobite Steam train, which is the one used for the film and which goes straight over the viaduct! The train goes from Fort William to Mallaig and does get booked up well in advance, so be sure to book early! We got the drone out and took some amazing shots of the viaduct and Loch Sheil, as you can see in the video above. This is the loch used as Hogwarts Lake, along with Loch Morar. This is where Buckbeak dips a happy toe (claw?) in the waters in Prisoner of Azkaban. We parked in the visitor centre on the shores of Loch Shiel, which also allowed a walk up the slope for incredible views of the viaduct, even in the rain! Loch Eilt, along the same road as the viaduct and Loch Shiel, is where the little island of Eilean na Mòine lies, which played the starring role as the site of Dumbledore's Grave. We sent the drone up to get a picture of this beautiful island… but alas, Mr WB is NOT a die-hard Harry Potter fan (boo!) and therefore had no idea which island he was meant to be filming. Bless him, at least he tried! It's about an hour drive from the western end of Loch Ness to Mallaig, which is where the ferry to Skye goes from. You can also drive over the bridge to the Skye- but it's much further north. Search “Isle of Skye” on Google and you'll get pages and pages of blog posts and itineraries, all waxing lyrical about the beauty of Skye. And they're right- it is beautiful. And there's loads to see and do. As long as it's not raining!! When I was writing this post, I realised that I never actually published our Isle of Skye video from last summer. And that's because it's basically 48 hours of solid grey drizzle, rain and win. You know what- I might publish it just to prove my point!! What I found most surprising about Skye is that there are STILL MIDGES in the rain!?!?!?! How is that even possible??? We are not ‘hike whatever the weather' people. And being sopping wet and cold isn't our idea of fun. So, sadly, we didn't get a chance to do many of the things we wanted to do. We did do the Talisker Whiskey tour, which was great, and enjoyed driving around the island, but we hope to return one day to see more. This was one of our longest driving days- about 5 hours and 350km. Leave Skye and head up towards Thurso, stopping at the incredible Eilean Donan Castle on the way. We didn't go inside, as we knew we had a long day ahead of us, but it's beautiful from the outside. There's also a little cafe here which does a great coffee! You can't come to Scotland and not stop to see Loch Ness- will YOU be the one to find the Loch Ness Monster?? Loch Ness village itself is VERY touristy. It's ok for young kids, but it's pretty expensive, so you might want to keep driving and stop at one of the many laybys along the loch. You can also visit Urquhart castle, which are impressive ruins along the shore of Loch Ness. There is parking here, but it can be limited for Motorhomes, so be prepared to have to park some distance away in high season. Alternatively, why not treat yourself to a boat trip on Loch Ness and be taken there in style!! Be aware of your fuel levels on this part of the trip- we passed very few fuel stations. We did debate going all around the western edge and completely the NC500, but we decided to cut across, to save time, see Loch Ness and to escape the rain! Did we miss some beautiful views and places by cutting through the middle? Absolutely- but with only 10 days, we had to choose what worked for us. If you have the time, take the slow route. Apparently, Ullapool is gorgeous. We used the A87, which passes down the side of Loch Clunie, which is actually a hydroelectric dam. It's a very pretty place for a picnic if the weather is pleasant. We made it to John o'Groats! We made it! We finally made it to John o'Groats. It was awesome to be there but, I'll be honest, the place is a little underwhelming! There were a few tourist shops, a harbour and a snack shack- that's about it! We waited for the post to be clear so we could take photos… and then we were a bit confused about what to do next. That's the weirdest thing about travelling- when you finally get to your destination, it can sometimes feel a little hollow. But we were blessed with INCREDIBLE weather- definitely made up for the misery of Skye! Whilst we were at John o'Groats, we saw a postcard of the Duncansby stacks, which were apparently just down the road! We'd never heard of them before, but they looked like fun, so we decided to pay them a visit. They're a little tricky to find, but well worth the effort! Basically head for Duncansby lighthouse and park right next to the lighthouse. Then walk (with the lighthouse on your left) over the field and keep going- you'll see them from the bottom of that field. PLEASE be careful with kids and dogs… it's a sheer cliff and a long drop. Here's the first EVER video where we flew our drone over the sea… the views of the shoreline and the rocks are incredible. We stayed at Dunnet Head campsite for a couple of nights, which allowed us to ride our motorbikes and leave the motorhome somewhere safe. If you're looking for a beautiful spot to stay, we highly recommend this campsite- lovely wardens, great little shop and stunning location right on the beach!! Just look at this view!! We drove to Aviemore for the night, which was another hour or so south. Aviemore is in the Cairngorms National Park and is Scotland's winter sports mecca, but there's plenty to do in the summer too. Restaurants and shops were open, as were many outdoor activities for all ages. The Aviemore website is a great place to find out more. Sooo… before we go any further… DO NOT DRIVE YOUR MOTORHOME INTO THE MIDDLE OF EDINBURGH. Let me repeat that so it sinks in. DO NOT DRIVE YOUR MOTORHOME INTO THE MIDDLE OF EDINBURGH!!! We tried it. With a Motorbike trailer on the back. It did not go well. There are NO Motorhome parking spaces near the City Centre. And the streets are narrow and not designed for lorries, let alone Motorhomes! You will not be popular!! We stopped in Edinburgh for a few hours and, honestly, the only thing we did was see Edinburgh Castle- which is beautiful but left us wanting more! We're already planning a trip back up sometime… just maybe not with the motorhome!! But from what we saw, there's at least 3 days worth of activities in Edinburgh if you have the time! Have you visited Scotland? Where was your favourite place? If you haven't, where would you like to go first? Love love love this itinerary (and all the Harry Potter references). Scottland has been on my list for a while and this post just organizes everything beautifully. Love the pictures! That Isle of Skye does look amazing but I hear you, when it’s raining and miserable outside, just give me a hot bowl of soup or something and a cozy place to sit in and watch the rain… Great itinerary! hope I’ll get to explore Scottland soon. Thanks for sharing an incredible amount of things to do and see in your Scotland driving itinerary. I would really love to get to the Isle of Skye, the Duncansby Stacks and Dunnet Head for those incredible coasts and views. 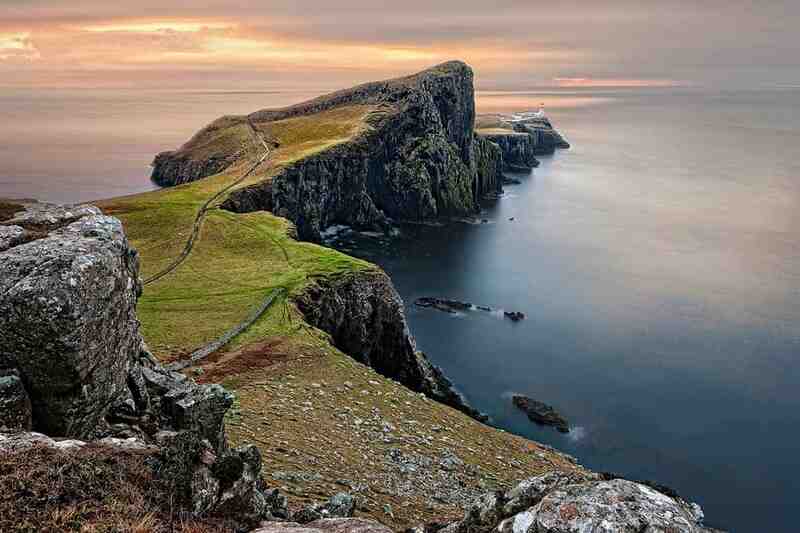 Have added these to my list of “must-dos” for a future driving trip to Scotland! Loved this post. A motorhome/motorbike combo sounds perfect for a trip like this. We keep meaning to go to Scotland (we only live in Manchester 😂 but never make it – this itinerary might just be the push we need to hire a camper and do it! Wow that’s a very comprehensive post! I’ve done a similar trip to Scotland so can relate. Thanks for sharing! This is a wonderful itinerary— especially intrigued by Dunrabie Castle which I’ll aim to see next time I’m in scotland. Even though I don’t ride a motorcycle this itinerary is clearly one to keep. This is an epic trip! Scotland has been on our list for too long, and this post may just be the thing that finally gets things moving. Wow I had no idea Scotland was this beautiful ! I am doing some Europe travel next year – I’ve never been ! Your pics are amazing ! I knew Scotland was gorgeous but WOW is it gorgeous. Sadly I’ve only ever been to Glasgow and Edinburgh (like you I prefer Edinburgh) but haven’t had the opportunity to explore the countryside. But, it’s something I would love very much to do. thank you for such a wonderful guide. I’ll certainly be referencing it when I finally have time to explore. What would be an expected rental rate for a Motor home for two weeks? What would be a rental rate for a Motor home for two weeks? Hi Mike, that will depend on a lot of things, like time of year, destination, group size and driver experience. So assume I would be there in the Summer months and would be there with a party of two. Little experience with an RV but have been driving for 40 + years. What would be a ball park number to use for the cost of the RV rental for a two week period?